As a follow up to last month’s column that focused on area Farm-to-Fork restaurants, I interviewed contacts at two local farms who are committed to sustainable agriculture and working with restaurants to bring local foods to our community. 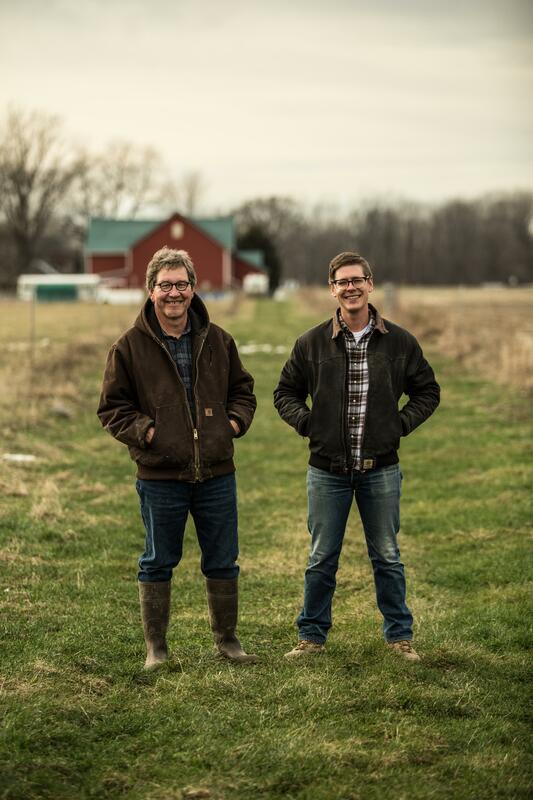 Kara Gunthorp, Director of Sales and Marketing at Gunthorp Farms, and Zach Hawkins, Farmer at Hawkins Family Farm, explain their philosophies and why they think eating local is so important. Tell me a little about your farm. 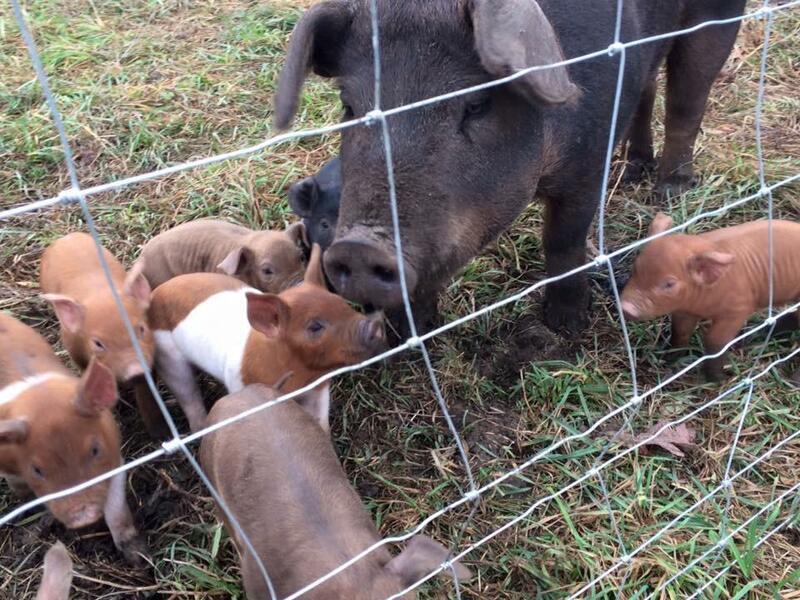 KG: Gunthorp Farms is a small farm in LaGrange, Indiana. We currently farm about 260 acres, between what we own and what we rent. Gunthorp Farms started in 1998 when Greg Gunthorp (my dad) was selling live hogs to the commodity market for 5 cents a pound—less than what his grandfather sold them for in the depression. In 1998, he sold his first hog to a restaurant (Charlie Trotter's in Chicago) and has been in the meat business ever since. In addition to my mom, dad, brother and sister, we have twenty full-time employees and ten part-time employees. 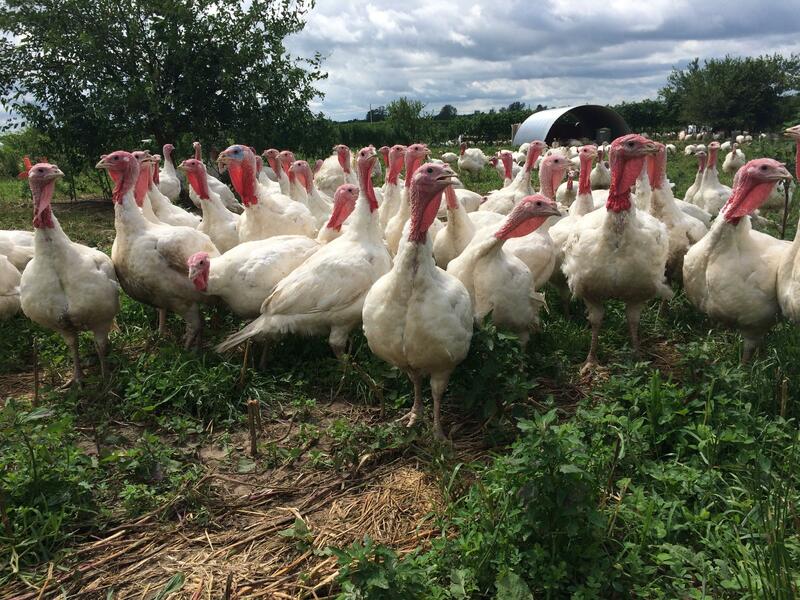 We raise pigs, chickens, ducks, and turkeys all on pasture without the use of antibiotics. We have an on-farm USDA inspected meat processing plant where we do everything from whole animal butchery to portioned cuts like pork chops, and even a full line of ground products and smoked meats. Both our land and our processing plant is certified organic, so we are not applying harsh chemicals to our products at any point in the process. 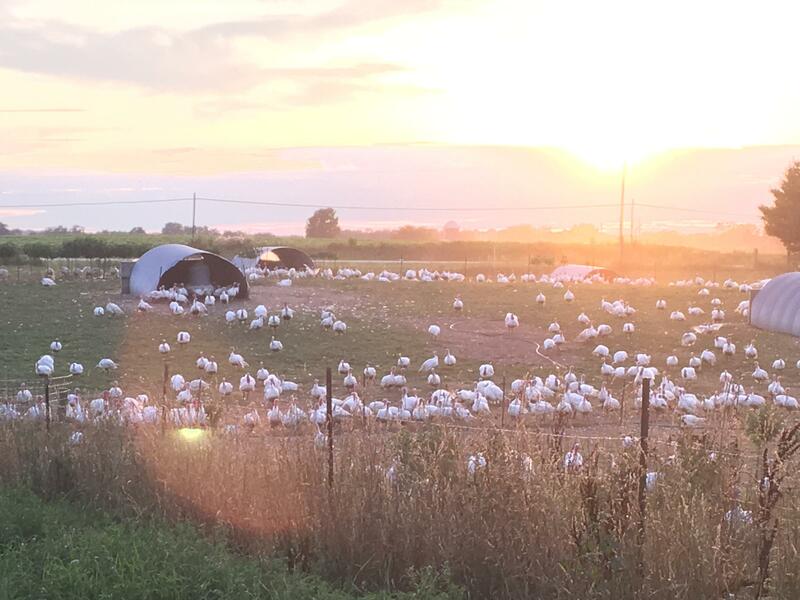 ZH: Ours is a ninety-nine acre family farm located outside of North Manchester, in northern Wabash County. My father and I raise poultry, hogs, cattle, small grains, and over fifty kinds of garden vegetables and herbs. 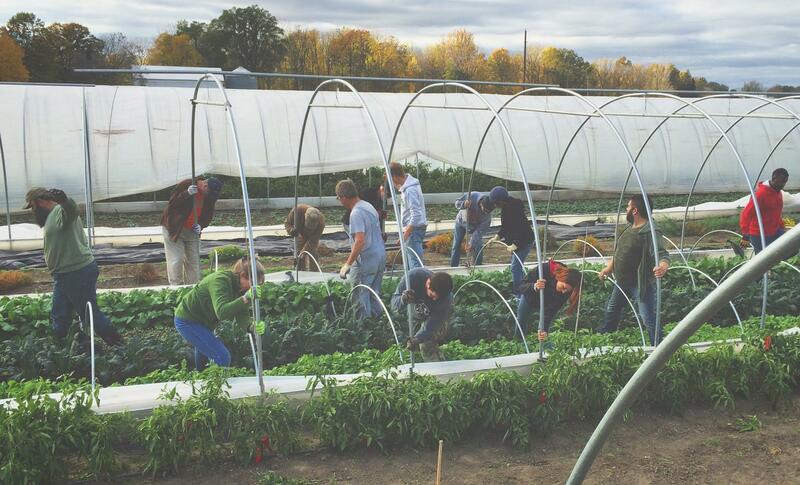 Seasonally, we employ two full-time farmhands, an intern or two, and a couple part-time helpers. We also hire a crew of four to six people to help butcher chickens on Saturday mornings, June through November. If you had to sum up your philosophy in a few sentences, what would you say? KG: Our philosophy at Gunthorp Farms is that everything we do requires the utmost amount of respect, whether that be in how we raise the animals, how we slaughter the animals, or how we deal with advocating for our industry. We believe that consumers have the right to know where their food is coming from and how it was raised and processed. We are proud to give consumers what they are looking for. We also hope to be role models for other farmers and small processors in the industry who are looking to get into direct marketing. A good community starts with good food, so any time we can help others through some of the many hurdles that we have had to face, it feels like a huge win for us and the local food movement. ZH: Our way of farming embraces the perennial unfurling of these questions: What it this place? What is nature doing here? How should we live in it? One result is the conviction that nature is on the side of life in its abundance, wholeness, and health. What do you think of the growing farm-to-fork movement? How has it influenced the way you do business? KG: It's funny that you ask this. The farm-to-fork movement is all I've ever known. We've been selling meat to restaurants since I was 4 years old. I don't remember the times that we were selling hogs for five cents a pound live weight. I don't remember a time where the people who were buying our hogs had absolutely no appreciation for the hogs. When I started tagging along with Dad to the kitchens of some of the nicest restaurants in Chicago, I just thought it was normal for everyone in the kitchen to be excited that we were there. I didn't realize that most places didn't have a relationship with a farmer. All I knew was that every single place that we sold to appreciated our products and all the work that we do. It took until high school to realize that what we do wasn't the norm. When I was in FFA, some kids got hostile with me about us being "weird organic farmers." At Purdue, I found myself sometimes skipping out on the details of our farm just so that I wouldn't get those "oh, you're different" kinds of looks. Now that I'm back working on the farm full time, it's so nice to be immersed in the farm-to-fork movement. I love that it's becoming more of a norm to buy products directly from farmers. It definitely makes my job in sales a whole lot easier! If I had been in sales before the farm-to-fork movement took off, I would have had to overcome a lot more barriers than I do now. People come to me looking for product, and for the most part they aren't sticker shocked by our prices or completely outraged by our once a week delivery. Most people who come to me by now have worked with some farm to table farmers so they know what to expect. It just makes my job easy for the most part. I can spend my time talking to customers about what makes us unique instead of spending my time trying to convince people to give us a shot and that buying directly from a farmer is worth it. ZH: I’m glad to see people in our region rediscovering the pleasures of eating fresh food, raised nearby. It’s a way of farming and eating that was ordinary to past generations. We have the capacity to feed ourselves well, given our good soil, so it makes sense to do it. To me, things often associated with the label “farm to fork”—flavorful, healthy food, the joy of cooking, shared meals, skilled artisans, inspired chefs, good farmers, discerning customers—seem less like the notions of a trendy movement and more like the best possibilities of living here. One of the benefits to farmers of reducing the distance between the farm and the dining table is that we can farm with the names and faces of our customers in mind. This profoundly influences the way we farm because we aren't just producing a commodity for an anonymous market; we are growing food for family, friends, and neighbors. Sourcing foods locally tends to be more expensive than purchasing through a large wholesaler. What are the benefits of partnering with local farmers? KG: Buying from local farmers is more expensive and more of a hassle than just calling the US Foods guy and having whatever you need delivered the next day. Local farmers often need more notice and can't fill an order that is placed the night before you need it. They also often have very limited delivery options. Working with a local farmer isn't always easy, but it definitely has its perks. First, the money that you spend with a local farmer is money that is staying in your community. That farmer will use that money to make more products, pay employees that are a part of the community, or spend it at places within the community. Supporting local independent farmers creates huge ripples of rural development for the local area. Another benefit is the one-on-one relationship with the local farmer. If you're looking for a specialty product, odds are good that you can talk to your farmer and discuss the reality of whether it is feasible for both of you. For us, that means we can do specialty cuts, sausages, and smoked meats for our customers. Some even give us their own recipe and have us make their product for them every week. (Rick Bayless worked with us to perfect a chipotle garlic loin recipe that we now use to make his smoked chipotle garlic loins for his tortas out at Frontera Tortas at O'Hare.) For produce farmers, you can sometimes talk about different crop options for the upcoming season. Your relationship with your farmer can be personalized to fit your needs. ZH: As people discover the value of local food, I hope it will be accompanied by clear-eyed scrutiny of the industrial food system. We need honest accounting. Cheap food costs plenty—in the diminishing of flavor and nutrition in food, in healthcare bills, in the loss of soil, farms, and farmers, in the pollution of water, in the withering of rural communities, and in the fragility of a centralized food system. When people purchase food from a local farmer, not only do they have a greater chance of receiving a product superior in flavor and nutrition, they are kindling the possibility of a culture that conserves land, people, communities, and local economies. Opinions expressed in this column are those of the individual writer and do not necessarily reflect the opinions of the staff, management or board of Northeast Indiana Public Radio. If you want to join the conversation, head over to our Facebook page and comment on the post featuring this column. Amber Foster is a freelance writer, community volunteer, mom, and food aficionado. Find her at www.agingerinthekitchen.com.